I can not begin to express how much renewal and knowledge I gained in my two Fund for Teacher's fellowships. It was life changing at the very least. This grant is tailor made for teachers who are looking for a specific type of professional development – heartfelt and passionate!!! I first applied for this grant in 2005 for a fellowship to Switzerland, France, and Italy. I wanted to see European classrooms and visit the locations where the fairy tales were written plus find materials in museums for my arts integration. 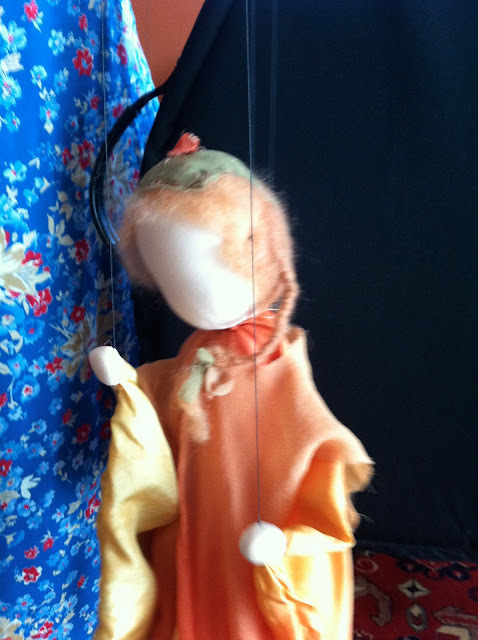 I wrote my second grant to attend a puppetry course I had on my list to do “some day, one day” for over 10 years. Hand dyeing silks for puppet making! Ask yourself: What experience would ignite my teaching life? What professional development have you secretly wanted to take but could never justify spending the money on? Dream big and be unreasonable! Go for the big ideas! Write from your passion. And be authentic. Look to see how your passion could benefit your community and school. A great idea will always have an impact! Be willing to just go for it and fail trying. My first application was written just days before the deadline. CLICK here to see if you qualify and to get an application. Your family can travel with you on your adventure. The grant will NOT pay for their travel expenses. I repeat, it will not pay for your family's travel expenses BUT it is okay if they stay in your hotel room, ride in your car, eat from your plate. . . My husband flew to Paris and spent 4 days with me. It was heaven. Make 2013 the year you get the most inspiring professional development available on the planet. The one you design. . .